P. 87 - Robin Hood to get an RMC Make Over for 2019! ^ I was kind of hoping on more being released other then the outside banked turn. But still maybe next video? Interesting it's going to be longer then before, I did some research and it turn out only the Cedar Fair RMC added track lenght so that spikes my intrest a bit more. RCT3Bross wrote: Past night Robin Hood made it's last rounds around the track. After closing hours (23:00 October 28th) there was a special event (around 01:00 October 29th) for 24 people to say goodbye to the Wooden coaster. It was here that they revealed the name of the RMC: Untamed. Untamed will open July 1st 2019. Groundwork had been started last week while the ride was still operational but now with the park closed till April 2019 the real work can start. A spokeperson has promised that they will keep fans posted on the lasted developments. There has yet to a full lay-out reveal. Personal thoughts: I like the name, despite being a bit bland for an RMC if you ask me. Saturday there was a rumor the ride might be called Timber Trip. So it being revealed as Untamed was a nice surprise. I'm a bit disapointed they didn't reveal more but they only promised the name so I can't be too mad. 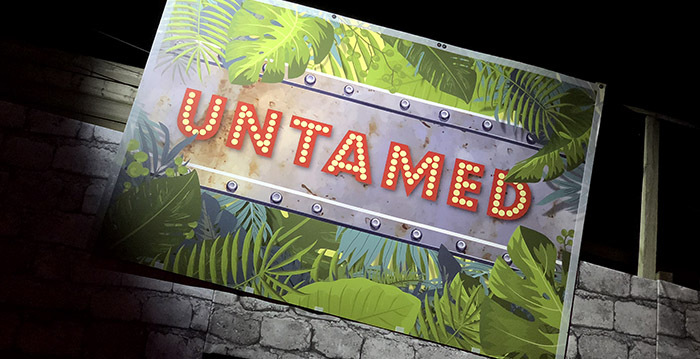 I like the name "Untamed," too. It's definitely better than, say, "Twisted Robin Hood." The new rollercoaster Untamed in Walibi Holland is getting a pretty steep descent. After a 36.5 meter high lift hill of 40 degrees, passengers will fall towards the ground almost vertical. The first descent gets an angle of 80 degrees. That is 10 degrees steeper than the first descent of the park's famous mega coaster Goliath. As a recent Rocky Mountain convert I'm pretty stoked about this one. Nothing massive, just a really freaking good new coaster. That video was a bit more interesting then the previous two. I already predicted the drop would be near 90 degrees down (I was thinking about 80 to 85 degrees) because well RMC is known to do that. Also there are 2 shots on the Turn around filled with Ledgers that hint towards a Zero G roll and it seems to go almost all the way down, what I hope they would do, before entering a hill. Coming back on the Ledgers, I always thought those would come from the same plant as the track. I didn't know those where made local. I'm still exited that this ride is so close to home. I like the way that they're leaking the new layout to the coaster one video installment at a time. Helps add to some of the suspense and anticipation. Can't wait to ride this when we're back in Amsterdam (& Paris), in 2022.